On Monday, May 28, the Romans knew that their moment of truth was upon them. There was a weird calm from the Turkish camp. The Sultan had ordered a day of rest before the final assault. Those in the city who could be spared from manning and patching up the battered walls took to the streets in prayer. Constantine ordered that icons and relics from churches and monasteries be carried round the walls while the church bells rang. Constantine lead the procession. When it was over he assembled his ministers, officers and soldiers and addressed them. There are three accounts of what he said. The first and shortest of them is contained in a letter of Leonardo of Chios, the Latin Archbishop of Lesvos, addressed to Pope Nicholas V on August 19, 1453. 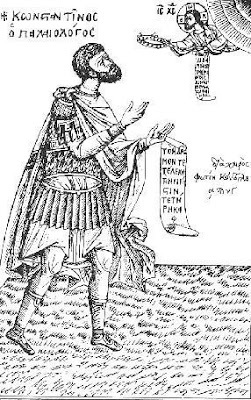 Leonardo had been present during the last weeks of Roman Constantinople and he reported to the pope some six weeks after the capture of the city, while his memory was still fresh. The two other and longer versions of Constantine's speech are mainly elaborations and extensions of Leonardo's text. One purports to be from the pen of George Sphrantzes, who must certainly have heard the speech though he makes no mention of it in his memoirs. It is to be read only in the extended version of those memoirs compiled in the sixteenth century by Makarios Melissenos. The third version is given in the Greek Chronicle of the Turkish Sultans, also of the sixteenth century. "Gentlemen, illustrious captains of the army, and our most Christian comrades in arms: we now see the hour of battle approaching. I have therefore elected to assemble you here to make it clear that you must stand together with firmer resolution than ever. You have always fought with glory against the enemies of Christ. Now the defence of your fatherland and of the city known the world over, which the infidel and evil Turks have been besieging for two and fifty days, is committed to your lofty spirits. Be not afraid because its walls have been worn down by the enemy's battering. For your strength lies in the protection of God and you must show it with your arms quivering and your swords brandished against the enemy. I know that this undisciplined mob will, as is their custom, rush upon you with loud cries and ceaseless volleys of arrows. These will do you no bodily harm, for I see that you are well covered in armour. They will strike the walls, our breastplates and our shiellds. So do not imitate the Romans who, when the Carthaginians went into battle against them, allowed their cavalry to be terrified by the fearsome sight and sound of elephants. 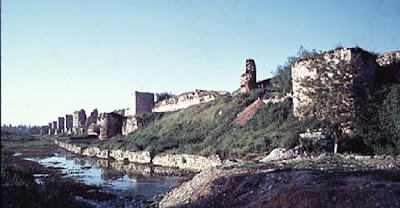 Now he threatens to capture the city of Constantine the Great, your fatherland, the place of ready refuge for all Christians, the guardian of all Romans, and to profane its holy shrines of God by turning them into stables for fits horses. 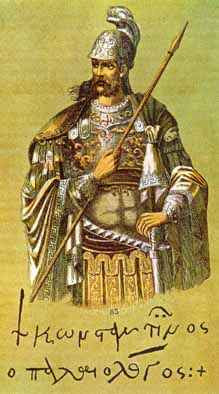 Oh my lords, my brothers, my sons, the everlasting honour of Christians is in your hands. You, my comrades in arms, obey the commands of your leaders in the knowledge that this is the day of your glory -- a day on which, if you shed but a drop of blood, you will win for yourselves crowns of martyrdom and eternal fame." All the people of the City then gathered into the Church of Hagia Sophia to pray for deliverance and celebrate the Divine Liturgy. After everyone, including the Emperor, received Holy Communion, they asked forgiveness of one another. Many kept vigil the entire night, while others prepared for the final showdown against Sultan Mehmed and his Ottoman hordes. 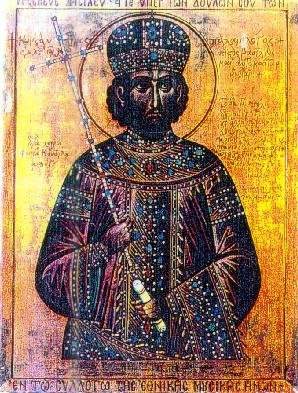 Emperor Constantine himself then went back to his palace at Blachernai to ask forgiveness from his household and bid them farewell before riding into the night to make a final inspection of his soldiers at the wall. He then kept vigil at the palace the entire night praying to God. The next day the decapitated head and body of the Emperor was found amidst other decapitated corpses. We know it was taken to the Sultan to affirm that he was the new ruler of the Roman lands and the conqueror of Constantinople. Then there are differing accounts as to what happened to the body. Some say it was given to the Christians to give an emperor his proper burial, while others say the Sultan packaged the head and sent it throughout the lands of Persia, Arabia and Asia Minor as a symbol of his victory. Maybe both accounts can be reconciled however. The Lamentation of Greece and Orthodoxy over the body of Emperor Constantine, painted by Photios Kontoglou. 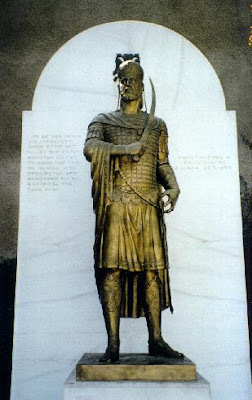 Since the erection of the statue of Emperor Constantine IX in Athens, every year on May 29th the Greeks gather and offer a memorial service in his honor. His reverence has reached the point where he is honored as a Saint of the Orthodox Church. "To deliver the city it is not my own right nor any other person of her residents, because it is our common decision to die all of us and not to spare our life." 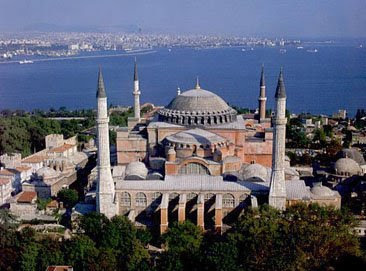 "Breaking down the doors with axes, the Turks entered the Church [Hagia Sophia] and dragged the fugitives off to slavery. Two by two, the men were tied together with cords, the women with belts, without consideration for age or station. Scenes of indescribable horror ensued. The icons of Saints were shorn of their jewels and smashed. The gold and silver Church vessels were seized, the altar cloths used for caparisons. Topped with a Janissary's cap, the crucifix was paraded in mockery. The conquerors used the altars as tables; when they themselves had finished eating on them, they turned them over to the horses for feed troughs or used them as beds on which to assault boys and girls."